Most Holy and Gracious Father, we give you thanks for the Roman Catholic Church, our brothers and sisters in Christ. With them we celebrate and offer you our thanks and praise for the election and calling of Pope Francis. Fill his heart with such love of you and of all the people, that he may feed and tend the flock of Christ, exercise without reproach the high priesthood to which you have called him, serve before you day and night in the ministry of reconciliation, declare pardon in your Name, offer the holy gifts, and wisely oversee the life and work of the Church. By your grace, and sustained by the prayers of the Blessed Virgin Mary, St. Francis, and all the saints, make him an instrument of your peace. Where there is hatred, let him sow love; where there is injury, pardon; where there is doubt, faith; where there is despair, hope; where there is darkness, light; where there is sadness, joy. *Adapted from the Book of Common Prayer, “The Ordination of a Bishop,” and the Prayer of St. Francis. Thank you for your generous prayer. 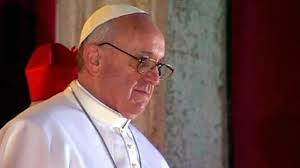 Pope Francis is indeed a gift to the whole people of God. May we walk together in love, as he called on us last night. Thank you for your generous and loving prayer. Pope Francis is indeed a gift to the whole people of God – may we walk together in love as he called on us to last night. There is one Lord, one faith, one baptism, one God and Father of us all. His choice of name I feel says much about the Papal direction he wishes to take. It could be very interesting. Oh, yes! A profound prayer for Pope Francis I. Thank you. I join the prayer.